For classroom applications, Universal Lighting Technologies offers five complete ballast families to ensure the best fit in terms of functionality as well as energy savings for any retrofit project. The most powerful option is DEMANDflex™ ballasts with a DCL Control System. Designed to operate two F54T5HO lamps or up to four F32T8 lamps, these ballasts can be individually “tuned” by the installer to the proper power level (ballast factor) in order to prevent the common problem of wasting energy on unnecessarily bright lights. After they are installed, DEMANDflex™ ballasts can work with a DCL Control System to provide unmatched energy management capabilities. DCL (Demand Control Lighting) technology allows an educational facility to control power levels to lighting fixtures in one-percent increments down to 50-percent power. Changes in power levels can be made manually by computer or they can be automated by scheduling software, occupancy sensors, or photocells for daylight harvesting. The ballasts and control system communicate on the circuit level so there is no need to install costly control wiring. With a DCL Control System, the facility can also opt into a demand response program where the local utility company has the ability to reduce power levels to the facility’s lighting fixtures in order to reduce stress on the area’s electrical grid in times of peak demand. Minimizing energy consumption during peak hours when electrical rates are at their highest can result in significant cost savings, whether the facility is part of a demand response program or is acting on its own. For pure energy efficiency in the classroom, AccuStart5® ballasts for T5 lamps provide an 8% energy savings or more compared to traditional T5 products. With Programmed Rapid Start Technology, these ballasts are ideal for classroom settings with a high number of on/off cycles or for multi-level lighting control. They offer more than 100 initial lumens per watt while helping the facility comply with ASHRAE, IECC and Title 24 energy codes. Plus, universal input voltage and a low-profile case simplify installation. AccuStart5 ballasts are available in .95 and 1.15 ballast factor options. Ballastar® T5 ballasts also offer up to eight percent energy savings over standard T5 ballasts, plus the ability to switch from half to full output via wall switch or lighting relay. The light-level switching capability of the Ballastar T5 allows for simple compliance with ASHRAE 90.1 and California Title 24 switching requirements. Unlike standard ballast and lamp switching, light-level switching illuminates an entire area evenly without dark spots. All Ballastar ballasts incorporate two “hot” power leads for control with two standard switches or relays, which simplifies installation. Switching on one lead provides 50-percent power, while having both switches on provides 100-percent power. These ballasts are also compatible with occupancy sensors and feature programmed starting for long lamp life. For programmable lighting environments with unlimited scenes and versatility, DALI (Digital Addressable Lighting Interface) technology allows lighting fixtures to be assigned to a limitless variety of lighting groups and each group can be programmed to perform multiple commands at the push of a button. Commands include on/off, light level control, scene recall, and more. This technology is ideal for classrooms where instructors need to switch between a wide variety of lighting arrangements. Wall station devices make initial programming and daily operation simple and convenient. DaliPro® ballasts from Universal Lighting Technologies are compatible with DALI technology while also providing high-efficiency operation for energy savings. The ULTim8® family of T8 ballasts is designed to provide a quick payback by slashing energy bills up to 40 percent compared to T12 systems and up to six percent versus standard electronic T8 ballasts. More than 57,000 ULTim8 ballasts were used in the retrofit project for Tennessee universities. 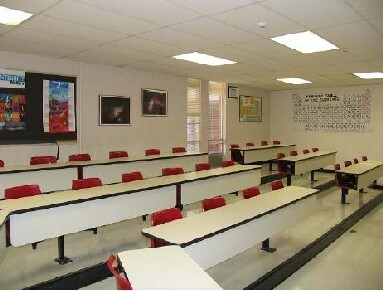 For more information about Universal Lighting Technologies, visit www.unvlt.com.